grothlamarath SLVI lol I think I may be running a 32 bit! Xannatharr SLV Good looking out Patriots, hopefully we don't have too many guys running the 32-bit client. Pilot Training Program (PTP) Class February 21! 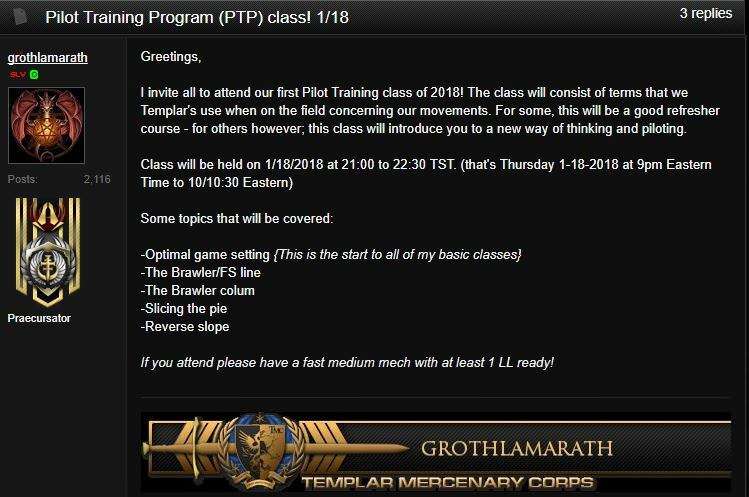 Pilot Training Program (PTP) Class February 8! You are all invited to attend another PTP class on Communication. The class will cover topics that everyone can use when it comes to communications on the battlefield. Knowing what to say and when to say it is always a great skill to have. Class will be on 2/8/2018 at 2100 to 2230 Eastern. -Knowing what to say, when to say it and what NOT to say! Please sign up on the calendar and come prepared to shoot BIG STOMPY MECHS! Really Good at Killing Linebackers? Event will run 9 - 10 PM EST in a private lobby. Need pilots of all skill levels to sign up.